City of Birmingham did well at the 2014 NAG Championships in Gloucester. Highlights included gold medals for Madison Griffith in the 18-19 Figures and for Madison and Hannah Smith in the 18-19 Duet. Madison also took silver for her 18-19 solo. The 13-14 team and the 19 & Under teams both won excellent silver medals against stiff opposition in the combination routines. Birmingham's Phoebe Bradley-Smith representing the England Talent Team was third in the international category for her solo and figures. Wonderful performances by all girls at the Novice Championships in Walsall produced a creditable result for the club. In the figures, gold medals were awarded to Elicia, Emily, Tegan and Holly; Olivia took silver and Katherine, Emma & Jas bronze. In the duet's gold medals were won by Tegan Smith & Katherine Richey & Shona Mills; silver by Olivia Hall & Eithne Evans and bronze by Eleanor Hall & Ellie Parker. The 12 & under team won a well deserved gold medal in for their routine. The whole team performed brilliantly in the Warwickshire Championships in Rugby at the weekend. In the Warwickshire competition Birmingham won 10 gold, 5 silver and 4 bronze medals. In the invitation competition, involving teams from throughout England, we won 10 gold, 3 silver and 1 bronze. Phoebe Bradley-Smith was part of the gold medal winning England Talent Junior Team at the 2014 Primorje Cup in June. Phoebe also swam well in the figures and solo competitions improving from 12th place (second highest England score) after the figures to a creditable 7th following a near perfect performance in her solo routine. The team performed exceptionally well in the British Championships in Sheffield. Phoebe Bradley-Smith got off to a great start on the first day with a silver medal in the Figures competition. On the second day Madison Griffith and Lucy Rouse took bronze in the Technical Duet and Phoebe finished second in the Free Solo with the smallest of margins between the gold and silver places. In the team routine we finished a creditable 4th place against stiff opposition with an excellent routine despite being one woman down due to injury. On the final day Lois Powell & Phoebe Bradley-Smith rounded off a fine Championships with a silver medal in the Free Duet. 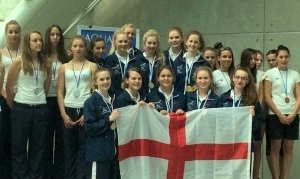 We made an encouraging start on the Friday when a new 19 & Under Combination Team that have only been swimming together for 5 weeks took the bronze medal against stiff opposition from across the UK. In solo events, Madison Griffith came an excellent 3rd place in the 19 & Under figures and Phoebe Bradley-Smith came 2nd in both the 15-17 Figures and the 15-17 Solo. The highlight of the weekend was a superb gold medal for the enchanting duet by Lois Powell and Phoebe Bradley-Smith (pictured). Two girls qualified for the forthcoming England Trials which take place at Crystal Palace. Sydney Jackson will swim in the England Development trials and Phoebe Bradley-Smith in the England Junior trials. Great performances by all girls in the combined Warwickshire ASA / Staffordshire ASA and Open Invitation Championships ensure an impressive haul of medals. In the Warwickshire we collected 13 golds, 5 silvers and 5 bronzes and in the Open Invitation 8 golds, 4 silvers and 3 bronzes. Phoebe Bradley-Smith won 5 individual Warwickshire golds and 5 individual Invitation golds plus further medals in duet and team competitions. Phoebe won the Warwickshire ASA Rose Bowl; best overall solo and best overall figures. Other highlights included the Presidents Shield for the duet by Lois Powell and Phoebe Bradley-Smith and the wins by the 19 & Under team in both Warwickshire and Invitation competitions. Our younger competitors also produced excellent performances. Sydney Jackson & Jas Lockhart won gold in the Warwickshire 12 & Under duet, Sydney won gold in the Warwickshire 12 & Under figures and Jas Lockhart won bronze in figures and solo routine in the 12 & under age group . The 13-14 team won gold for their routine in both Warwickshire and Invitation competitions. Last but not least the 12 & Under team which included a number of girls who were competing for the first time won gold in the Warwickshire Championships and silver in the Invitation. The Synchro section represented Birmingham admirably at the British Championships in Sheffield, an event made special by appearances by international athletes representing Great Britain, Canada and the Netherlands as well as the top domestic teams from around the country. The team came a creditable 5th in the free combination routine. The team practised a difficult lift time and time again during the warm up and just didn't seem to be able to get it right. However, when the pressure was on during their routine, the lift was executed to perfection as the girls produced a fantastic performance of the routine they've been working on since January. In the technical solo, Phoebe Bradley-Smith came 9th with Lois Powell and Maddison Griffith in 16th & 17th respectively. Phoebe qualified for the free solo on the second day finishing 10th. In the technical duet Phoebe and Maddison finished 12th and in the free duet Phoebe and Lois finished 8th.